Helical H Series Flexible Beam Couplings are ideal when high strength, excellent fatigue resistance and high torsional stiffness is called for in your application. The Helical H Series Flexible Couplings' premium performance capability is designed for applications requiring a heavy-duty coupling, such as drive systems, small pumps and gear boxes. 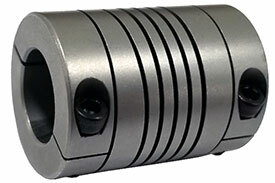 Helical H Series Flexible Beam Couplings feature an array of options, in a variety of diameter sizes, that allows you to tailor the H Series to your specific application. Helical H Series Flexible Beam Couplings feature options that include set screw or integral clamp attachments and inch or metric bores. Helical H Series Flexible Beam Couplings also feature a high torque capacity, high fatigue resistance and corrosion resistant steel (CRES). A1 Seating Torque : 4.5lb/in. A1 Center Line (Inch): .10in. A2 Center Line (inch): .10in. Torsional Rate: 0.24 degree/lb in. The Helical HCR062-5-5 Stainless Steel Flexible Beam Coupling, H Series is one of thousands of quality tooling products available from MRO Tools. Please browse Helical Flexible Stainless Steel Integral Clamp Couplings, H Series for tools similar to the Helical HCR062-5-5 Stainless Steel Flexible Beam Coupling, H Series. Helical HCR062-5-5 Stainless Steel Flexible Beam Coupling, H Series description summary: Helical Flexible Couplings, H Series. Outside Diameter: 0.5'' Length: 0.75'' Major Bore Diameter: 0.157'' Minor Bore Diameter: 0.157'' Momentary Dynamic Torque: 13lb/in Angular Misalignment: 5 deg Parallel Offset: .010'' Material: 17-4pH Stainless Steel Quantity discounts may be available for the Helical HCR062-5-5 Stainless Steel Flexible Beam Coupling, H Series. Please contact MRO Tools for details.